The growth of alternative lending options in Europe, such as peer-to-peer (P2P) lending, will require new regulation and oversight, according to a report. The Alternative Lending Index (ALI) report, authored by P2P lending platform TWINO with KPMG, examined the lending landscape in Europe between 2010 and 2016. The report pulled data from the European Central Bank, Eurostat, and non-Eurozone central banks to determine which European countries have the highest potential for alternative lending measures where there is a credit gap in the market. Alternative lending has grown since the lending crisis but the ECB does not monitor its development, according to Jevgenijs Kazanins, P2P platform lead at TWINO, a Latvian startup that provides alternative lending services. A request for comment to the European Central Bank’s press office was not returned before press time. As the alternative lending market grows it Europe, the industry will require regulation, he added. “As alternative lending industry will continue to grow we expect more proactive regulation both on a local level and European level, driven by alternative lenders and other participants of the market,” commented Julija Masane-Ose, deal advisory director at KPMG Baltics. The index measures countries on a scale of zero to 10 and found that countries that have bigger credit gaps tend to score a higher mark, or ALI. The highest-ranking countries for alternative lending are: Hungary (6.6), Slovenia (5.9), Latvia (5.8), Poland (5.8), Romania (5.7), Greece (5.3), and Ireland (5.2). Many of these countries are considered the most favourable for alternative lending in Europe with Poland, Greece, and Ireland having the largest potential for alternative lending, according to the authors. 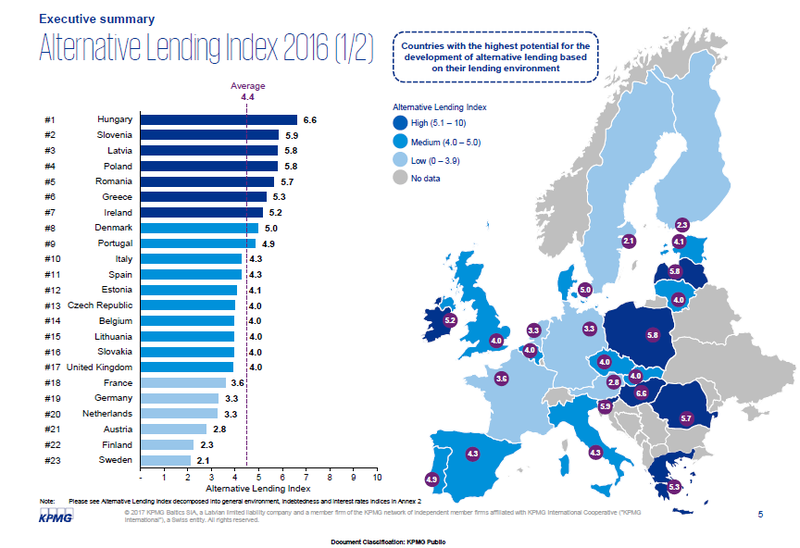 Meanwhile France (3.6), Germany (3.3), Netherlands (3.3), Austria (2.8), Finland (2.3), and Sweden (2.1) are described as having the most “highly efficient lending markets” and thus little need for alternative lending. In countries with a low ALI score, where alternative lending potential is low, it sends a message that companies should seek alternative investment opportunities in other countries, said Masane-Ose. During the period of 2010 to 2016, the density of credit institutions per one million people declined 19% to 15%. Ireland was ranked top for number of institutions per one million people with Austria and Finland following. The aggregate European credit gap has grown from close to breakeven in 2010 to 12 percentage points of GDP today. The report notes some key differences in the availability of financing for household and corporate borrower. In the UK for example it found that alternative lending is more suited for businesses rather than households as it is typically easier for households to get a loan.